When missionaries go overseas they begin forming a support team. This often takes place a few years before the missionary actually lands on the ground in their cross-cultural context. One aspect of this team is financial. And much could be said in this regard, both positive and not so positive. Another aspect is that of prayer. Martin Luther King Jr. once said, “To be a Christian without prayer is no more possible than to be alive without breathing”. A rather convicting quote. And a quote that those who’ve done mission work will resonate with. A prayer team is essential for those who are commissioned and sent to places around the world in order to spread the Good News of Jesus. I think this is the case for those of us in youth ministry too. Recently I’ve been convinced of the need to form a prayer team around me, my family, and the ministry we’re involved in. In fact, I’m not quite sure why I hadn’t initiated this previously. So about a month ago I sent an email to a few friends who I thought would be willing to commit to being on this team. I’m attempting to form a prayer team for me, my fam, and the ministry we’re doing at Rowville BC. It’s been something I’ve been thinking of for a while and sense the necessity for. You no doubt understand the need for this in your context and I believe it applies to local church min too. Anyway, this is simply to ask if you’re willing to be part of that team. What will it require, you may ask? (1) That you commit to pray for me, my fam and the ministry here at RBC once per week. (2) Actually pray for me, my fam, and the ministry here at RBC once per week. I’ll be committing to sending out an email to the group with 3 prayer points each week too. So far I’ve had nothing but positive responses, and there is no pressure to being on the team. I currently have a group of 7 willing to commit to this and there may well be others who will join over time. None of the members know who else is on the team as I simply bcc them in. None of them attend my church, and in fact many of them are overseas themselves. If you’re a Youth Pastor I reckon you should do this. You can’t do youth ministry alone. A team of people praying for you will hold you and sustain you. Prayer gets squashed out for programs and people. How much have you really prayed this week? This actually raises the temperature of your own prayer life too. It keeps you accountable. People are seeing what you need and will ask questions about it. You end up thinking about your priorities. To write 3 succinct points keeps you focussed on what’s important in life and ministry. It reminds you of the positive things God is doing through the ministry. Each week I write a little highlight at the bottom of the email. It’s encouraging to think about the positives for the week. It’s worth doing, I’d get on to it if I was you. For the last four years I’ve been behind the front lines supporting and encouraging Youth Pastors as they work on the ground in youth ministry. Time out has been good but for a while now I’ve missed it. Hence, I’m back and loving this new season here at Rowville Baptist. It goes without saying that in the last four years I’ve aged. Everyone has. The guys I tracked with in my previous church were finishing up in Year 12, now they’re about to finish uni. I haven’t been a Youth Pastor in my 30s until now. I didn’t have a daughter four years ago. This isn’t a bad thing. Not at all. In fact, I think it is to my advantage coming back from a little break. As I’ve reflected on this in the last few weeks I’ve noticed three particular things about myself that I believe will help me be a better Youth Pastor this time around. I’ve realised my passion for youth and young adult ministry in a church setting has stayed strong. It’s where my sweet spot is. It’s what I enjoy doing and where I’m confident in being fruitful for the kingdom. In fact, it’s off the back of a conference last year where I began to think seriously about getting back into the day-to-day of youth ministry and the low embers were fanned back into flame. In four years I’ve been given a lot of perspective. Through the all-consuming nature of church ministry it is hard to see the forest for the trees. I’ve realised what a privilege it is to be walking with people as they explore faith and seek to follow Jesus. Being part of that can feel overwhelming and monotonous if you don’t have some perspective. I’ve been able to look at what’s important and what’s a waste of time to worry about. It’s been refreshing, particularly for someone who was born into a Baptist church 33 years ago. There are of course stresses that come in the short-term but it is the longer-term view that is so important to have. The slow growth of the gospel working its way into people’s lives and helping them to become more like Jesus. Youth ministry isn’t a fast game, as much as I’d love it to be, it’s for those who see God building His church in His time. Finally, I’ve become more productive. I’ve learnt how I work best, when I work best, and what tools I need to work more efficiently and effectively. Tim Challies recently wrote a book called Do More Better, in which he explains a system to help people work more productively. I was pleased that the three tools he uses were the ones I’d been using for a while (FYI – Google Calendar, Evernote and Todoist). It takes time to learn how to work and particularly in a role that is so flexible. If you’re a Youth Pastor I’d encourage you to work on your system. What are the things in your life that help you work at your best? Are you a morning or evening person? Are you planning well, in life and ministry? Are you getting enough exercise or recreation in order to function at your best? These are three observations about myself that I’ve noticed since being back in church-based ministry. What about you, what observations can you make about yourself as you age as a Youth Pastor? My father is a Pastor. My grandfather was a Pastor. My great grandfather was a Pastor too. When I was a boy I lay on top of my bed one night balling my eyes out. I didn’t want to be a Pastor. Because of the heritage of my family I thought that to be a ‘Coombs’ meant you had to be a Pastor. I looked down the generations and saw that the first born son turned out to be a Pastor. Something at the age of twelve I didn’t want to be. This was one of many unique challenges I can remember growing up as a Pastor’s kid (PK). Granted, this was more a phenomenon of our family’s rich Christian tradition. Yet, there are other challenges of living with the forever abbreviated title of ‘PK’ that others don’t face. And these challenges are the reason I find the book, ‘The Pastor’s Kid’ by Barnabas Piper an excellent book. 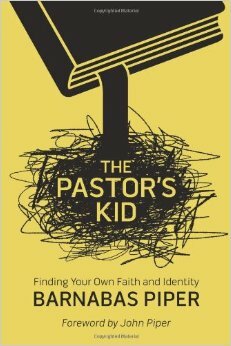 Piper has recently published this book about PKs for PKs, Pastors and churches. A book that “describes the unique challenges PKs have faced being the children of ministers”. After all, nobody chooses to be a PK, you’re either born into it or brought into it through the calling of your parents. On one hand it is a privilege. The constant meeting of new people from different parts of the world. The hearing of what God is doing in different countries and places. The unconscious absorption of biblical teaching. And the community of people that you’re surrounded by. All these things provide the PK with tremendous opportunity to hear about God, what He has done, and what He continues to do. On the other hand, it is a situation where the fishbowl of the local church can strangle the life out of you. Where there is an ambivalence to the truth because you’ve heard the stories so often. Church becomes a place where everyone knows of you, but no one actually knows you. Where expectations are laid on thick, from parents to congregation. And, of course, where you get to see the ugliness of sinners dealing with sinners from the front row. Therefore, PKs turn out differently as they seek to find themselves within the life of the church and the world around them. Some stay within the faith, following in the steps of their parents. Others rebel, leaving the church behind for a life apart from God. And others end up finding God and their place in the world in a way that is their own. Piper rightly highlights the need for grace for the PK, as they seek to grow from within the all-encompassing nature of church ministry. Grace that is experienced and shown, not just told. Grace that recognises that legalism and rules won’t help. Grace that recognises the PK has their own journey of faith-discovery and self-discovery. Grace that is therefore holistic, unassuming, respectful and full of hope for the PK as a person. Grace that comes from Jesus Christ, shown through the Pastor and the church. A PK isn’t anyone special. They are as special as everyone else. But they do have unique challenges. This book is a great conversation starter for you and your family. I’d strongly recommend you buy this book – read it and talk about it. It’ll help you as a PK. It’ll help you as a Pastor. And it’ll help you as a church member. This book review was also posted on the Baptist Union of Victoria’s ‘Witness Blog’ on the 22/09/2014.